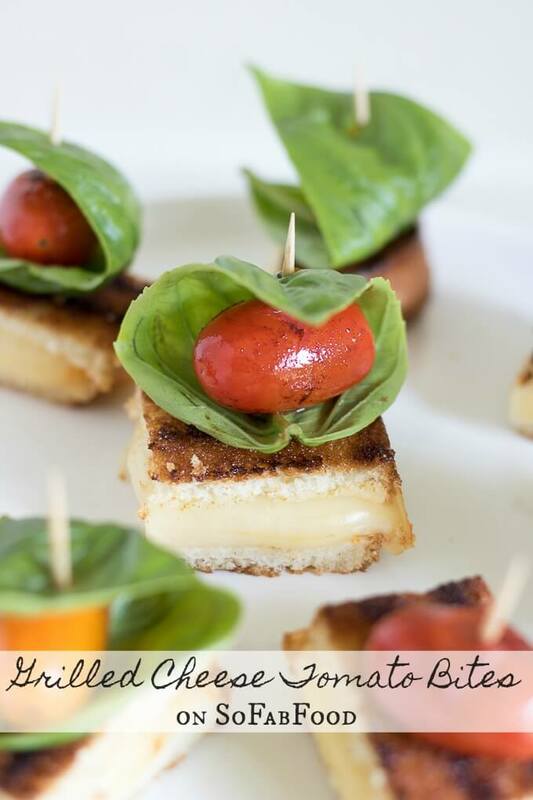 These Grilled Cheese Tomato Bites topped with blistered sweet grape tomatoes and fresh basil leaves. This afternoon snack recipe is a great twist on a classic grilled cheese sandwich you can’t resist. Hi Everyone, it’s that time of the month again when I share a teaser from my most recent guest post on SoFabFood! This Grilled Cheese Tomato Bites recipe is so good and savory. It has Muenster cheese but you can substitute your favorite cheese if you wish. I love how melt-y and mild Muenster cheese is in a grilled cheese. Mozzarella would be perfect as a flavor pairing with the blistered tomatoes and the fresh basil. If you want, you can try having it with more than one type of cheese. What’s your favorite way to have a grilled cheese sandwich? Please let me know in the comments below!